Alright, so I have a confession to make. This dish actually started out as an italian-style meatless meatball dish. It was supposed to be covered in tomato sauce and smothered in cheese and served on top of a plate of spaghetti. But, with an ice storm a brewin' outside, I did not feel safe venturing out to get the handful of ingredients that I was missing. So, I decided to just make a few changes and use whatever I had on hand. Basil became cilantro. Beans became chickpeas. And then, somewhere along substitution road, my meatless meatballs in tomato sauce became meatless falafel in yogourt sauce. Let me tell you, whatever you want to call them, these little babies are 100% pure deliciousness. Just a few things to note before you go off and make this. You MUST roast the eggplant the whole way through. No if's and's or but's, the roasted eggplant has a flavour and texture that is crucial to the texture of the final product. Also, the chickpeas are what give it that distinct falafel taste, so if you decide to sub them for something else, you're going to have a very different little ball! Oh, and be sure to use greek yogourt (I prefer to use 2% as it's creamy but still low in fat, but you can use any % that you like.) 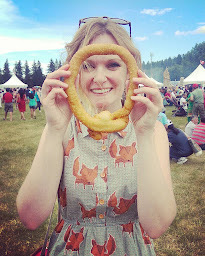 Vegan? No fret! Omit the yogourt sauce and replace it with some red hot sauce instead. Alright, let's get ballin'! An original recipe by Allison Sklar. Inspired by Meatless Meatballs, Food Network Magazine, Jan/Feb 2015. Begin by roasting your eggplant. Preheat oven to 375F. Place whole eggplant on a baking tray lined with parchment paper. Prick eggplant with fork all over. Roast for 45 to 50 minutes, or until it looks wilted on the outside and is soft enough to slice easily with a knife. Let eggplant cool, about 15 to 20 minutes, before using. While the mixture is cooling, prepare your "chia egg." (This is your binding agent!) Combine milk with chia seeds and let sit for about 10 minutes, until mixture is slightly gelatinous. Now, it's time to make the falafel! Mash chickpeas very well with a fork. 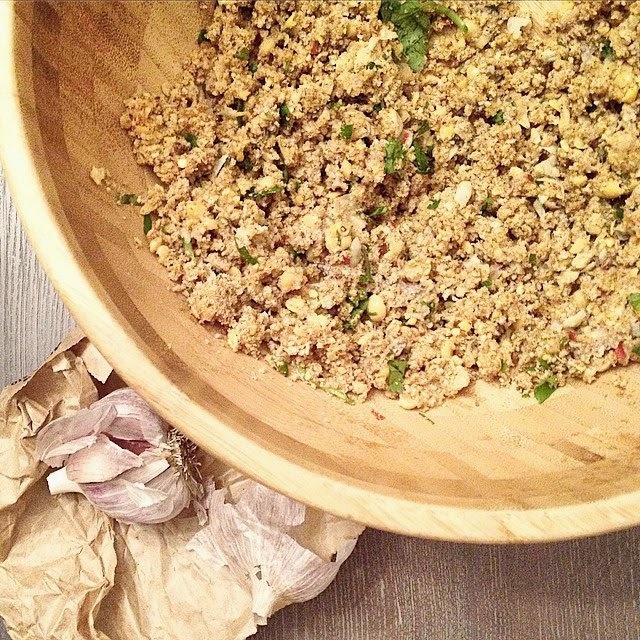 Mix together with breadcrumbs, cilantro and garlic. 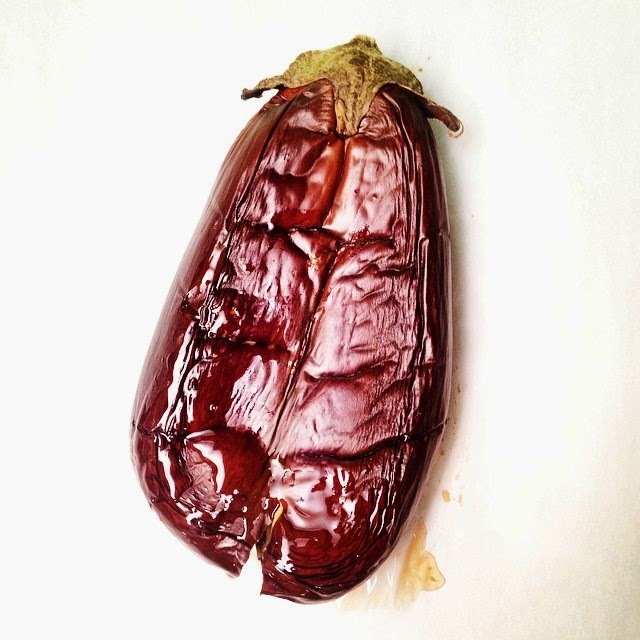 Once the eggplant is roasted and cooled, scoop out the inside, discarding the skin. Mash as well as you can, and incorporate it into the breadcrumb mixture. Add in the chia egg, and use your hands to bring it all together. Roll into balls and place on parchment lined baking sheet. Bake at 350F for about 20 to 25 minutes, or until golden on the outside. Combine cooled broth with yogourt, mixing well. 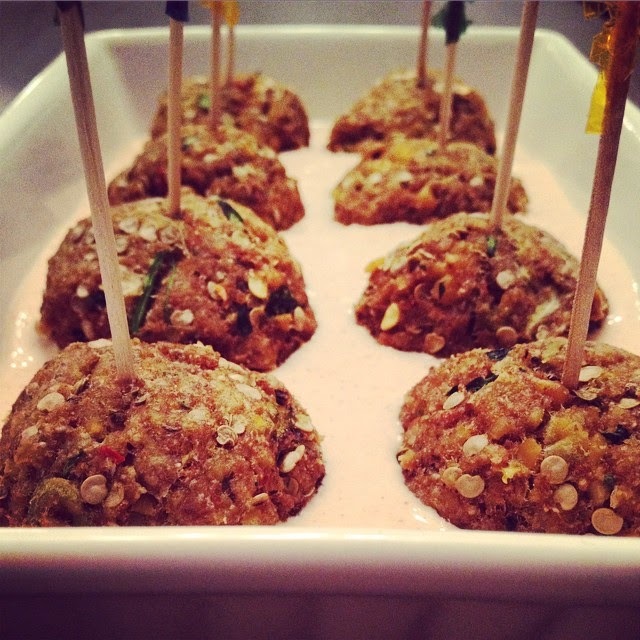 Serve hot falafel with cool yogourt sauce. Use more fresh cilantro to garnish if desired. You can roast the eggplant the day before. You can skip the broth part of the yogurt sauce if you want to, and instead, just mix yogourt with a couple of tsp of harissa or sriracha! Instant spicy yogurt!